I took this cruise with my husband and my two girls ages 13 and 11. We departed March 3, 2018 for what was to be a 7 night cruise. About a week before we set sail, we were notified that we would be having a 6 night cruise as they had to "dry dock" the ship. At first I was a bit upset, but it worked out just fine. Norwegian organized busses to take us to the Hilton Hawaiian Village for our last day/night. Everything went like clock work. I read a lot of reviews giving this cruise less than stellar remarks. I was a little afraid of what was to come. Rest assured, the ports are the attraction, not the ship. There is nothing wrong with the ship, it is just not their finest vessel. Meaning, there is no casino, no fancy pool slides etc. We saw two evening shows: a magic show and a Vegas style show. Both shows were great. We ate mostly at the Aloha Buffet and the Cadillac Diner. The food was good but we soon tired of eating the same thing every day. We could have opted to go to the other restaurants and pay but we preferred not to. 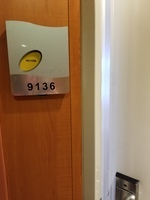 Our room was 9136, on the 9th floor mid-ship balcony family room. It was tight but adequate. Luckily we could push the suitcases under the bed and put stuff in the closet. I would suggest bringing removable 3M hooks to hang stuff up and then remove them before you leave the ship at the end. Our little desk area was so cluttered with phones, chargers etc. would have been nice to hang them on a hook. In the shower they had a clothes line to dry bathing suits, that was a nice surprise. 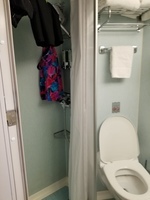 They also have a coffee maker and hairdryer for your convenience. Many posters complained about not seeing their room steward for a few days. I suspect it is because they arrive on ship, go to their room and then leave. We say our room steward daily starting on day 1. Our steward was very nice, very respectful and left the room immaculate daily. Another poster had recommended bringing lanyards for each traveler and a hole puncher. This was a fabulous idea. Everyone had their room key around their neck and there was no fear of anyone losing their key card. It also made for faster on/off the ship because their ID cards were always at the ready! 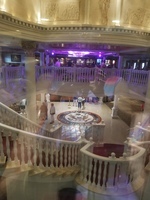 We were lucky to have a room on the starboard side of the ship. We got ALL the best views from our balcony, including the LAVA flowing into the sea after leaving HILO. Book the starboard side of the ship!! 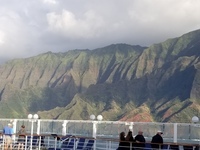 In Kauai, we had a lovely view of the mountains and harbor versus the ship security building view on the port side of the ship. All in All Well Worth Every Penny, and an absolutely wonderful way to see Hawaii. In ports we rented cars each day and did our own exploring. 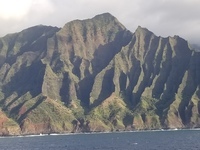 Got great deals on cars from Discounthawaii car rental. Also, we did the chiefs luau in Oahu, we bought it through Roberts and they gave us FREE tickets to see the Polynesian Magic Show. Really great nights!! Would love to go again!! I took this cruise with my husband and my two girls ages 13 and 11. 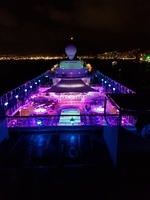 We departed March 3, 2018 for what was to be a 7 night cruise. About a week before we set sail, we were notified that we would be having a 6 night cruise as they had to "dry dock" the ship. At first I was a bit upset, but it worked out just fine. Norwegian organized busses to take us to the Hilton Hawaiian Village for our last day/night. Everything went like clock work. I read a lot of reviews giving this cruise less than stellar remarks. I was a little afraid of what was to come. Rest assured, the ports are the attraction, not the ship. There is nothing wrong with the ship, it is just not their finest vessel. Meaning, there is no casino, no fancy pool slides etc. We saw two evening shows: a magic show and a Vegas style show. Both shows were great. We ate mostly at the Aloha Buffet and the Cadillac Diner. The food was good but we soon tired of eating the same thing every day. We could have opted to go to the other restaurants and pay but we preferred not to. Our room was 9136, on the 9th floor mid-ship balcony family room. It was tight but adequate. Luckily we could push the suitcases under the bed and put stuff in the closet. I would suggest bringing removable 3M hooks to hang stuff up and then remove them before you leave the ship at the end. Our little desk area was so cluttered with phones, chargers etc. would have been nice to hang them on a hook. In the shower they had a clothes line to dry bathing suits, that was a nice surprise. 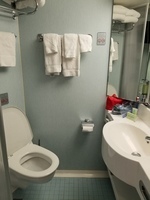 They also have a coffee maker and hairdryer for your convenience. Many posters complained about not seeing their room steward for a few days. I suspect it is because they arrive on ship, go to their room and then leave. We say our room steward daily starting on day 1. Our steward was very nice, very respectful and left the room immaculate daily. Another poster had recommended bringing lanyards for each traveler and a hole puncher. This was a fabulous idea. Everyone had their room key around their neck and there was no fear of anyone losing their key card. 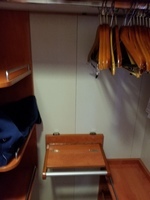 It also made for faster on/off the ship because their ID cards were always at the ready! 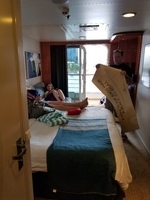 We were lucky to have a room on the starboard side of the ship. We got ALL the best views from our balcony, including the LAVA flowing into the sea after leaving HILO. Book the starboard side of the ship!! 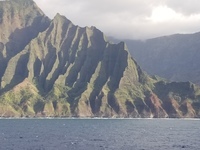 In Kauai, we had a lovely view of the mountains and harbor versus the ship security building view on the port side of the ship. All in All Well Worth Every Penny, and an absolutely wonderful way to see Hawaii. In ports we rented cars each day and did our own exploring. Got great deals on cars from Discounthawaii car rental. Also, we did the chiefs luau in Oahu, we bought it through Roberts and they gave us FREE tickets to see the Polynesian Magic Show. Really great nights!! Amazing Drive, get the Shaka Guide App, he will talk you through your whole ride and things you otherwise would have missed. Fabulous! Best Part of the Trip. Drove to VNP and saw the lava spurting up in the distance. Really loved the lava fields and the chain of craters road. Went though the Thurston Lava Tube, nice walk ending in a rain forest. Fabulous Day. At night, saw the lava flowing into the ocean from our balcony. Amazing. Drove to the Dole Plantation on our own. Took the train through the fields to let the kids see pineapple growing, cacao plants etc. Educational, nice visit. The Luau was Fantastic, really funny guy. The chief is really nice and humorous. The gates at the Pearl Harbor Visitor center parking open at 6am. We had a rental car and arrived at 6am. We were first in line. 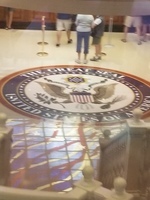 The line formed quickly and at 7am they let us in. We got tickets for the 7:30 tour. The tickets are Free so you need not pay a tour operator, simply go early. No bags are allowed inside so there are lockers outside. We were done and on our way to the Dole Plantation by 9:30am. We could have spent half the day there but we didn&apos;t have a lot of time. Visited the North Shore, had lunch at a food truck and then returned to Honolulu for the Chiefs Luau at Wet n Wild. Wonderful night of entertainment. Sunny on this side of the island. Stunning, Breathtaking Views of Waimea Canyon. Well worth visiting. Really nice. Rented a car right across the street from the pier. That was nice. Began the day by driving down to the Place of Refuge (Pu’uhonua o Honaunau national park) Then my daughter went snorkeling right next door at Two Step. Great Place with lots of fish. We toured Kona Joes Coffee on the way back. Nice stop. Great Coffee. Then we went to the Magic Sands Beach nearer to the ship. We returned the car and walked around town before taking the tender back to the ship. Peaceful Sacred Place, very nice visit. We rented a car and drove up Haleakala Crater. It&apos;s cold up there so dress warm. Then we went to a beach and everyone got sunburned. Amazing day. Really neat to drive on a road above the clouds. I believe it was 10,000&apos; above seal level up there. Stunning views. The beach was immaculately clean as was the water.